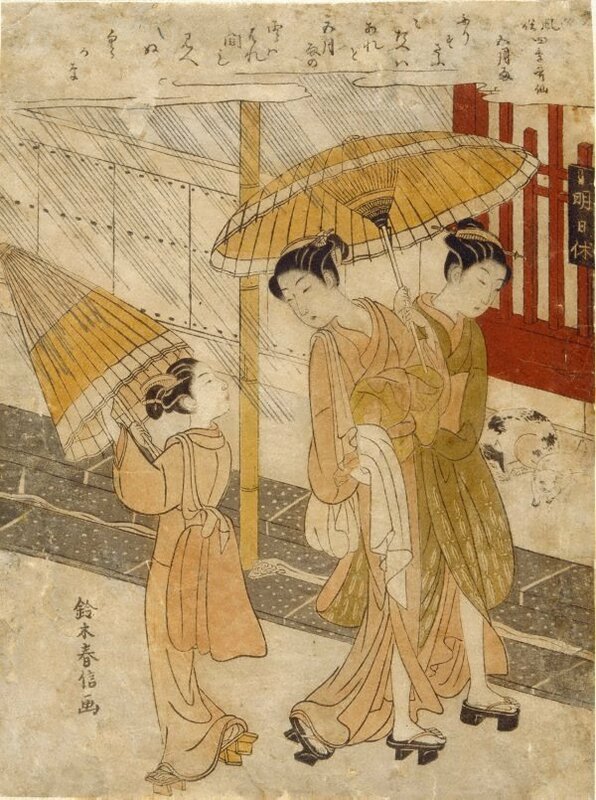 In most parts of Japan, the fifth month (present day June by the Gregorian calendar) brings lengthy rainy days. Although the rain is necessary for healthy growth of the rice crop, combined with pre-summer warmth it can cause health hazards and dampen spirit for the urban population of Edo. The poem reads: "The downpour ceases from time to time, but the sky is never seen clear of the summer rain clouds" (Furisusabu/ todae wa aredo/ samidare no/ kumo wa harema mo/ mienu sora kana) - translation by Jack Hillier 1970. Signed l.l., in Japanese, ink [incised on block] "Suzuki Harunobu ga [picture by Harunobu]".